Founded in 2003, LinkedIn has become one of the world’s most recognizable brands. Not only is it the largest professional network on the Internet – with more than 530 million members – but LinkedIn also generates revenue from Talent Solutions, Marketing Solutions, and Premium Subscription products. At its headquarters in Silicon Valley and in offices around the globe, LinkedIn’s 11,000+ employees are on a mission to connect professionals from all over the world to make them more productive and successful. “We wanted a program that could drive stability and emphasize our culture and values,” says Christina Hall, vice president, global talent at LinkedIn. Additionally, LinkedIn needed to modernize its spot bonus program, which wasn’t driving results. 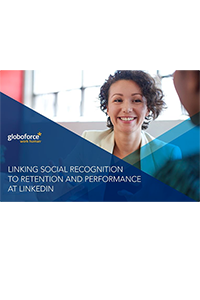 In 2015, LinkedIn partnered with Globoforce to launch Bravo!, a global, peer-to-peer recognition and rewards program. Unlike the former spot bonus program, Bravo! has clear ties to LinkedIn’s corporate values and is e¬fficient, consistent, and timely. Just eighteen months after launch, an in-depth study of Bravo! shows as the number of awards an employee receives increases, so do retention rates and year over year performance ratings.